« Guess what I didn’t give up for Lent! I have much to say about my day at Stitches West….it was a knitting homecoming! Karen H (good friend from Friday knitting workshop) and I shared the journey and the day. We lunched with Cameron and Merle of our knitting circle. 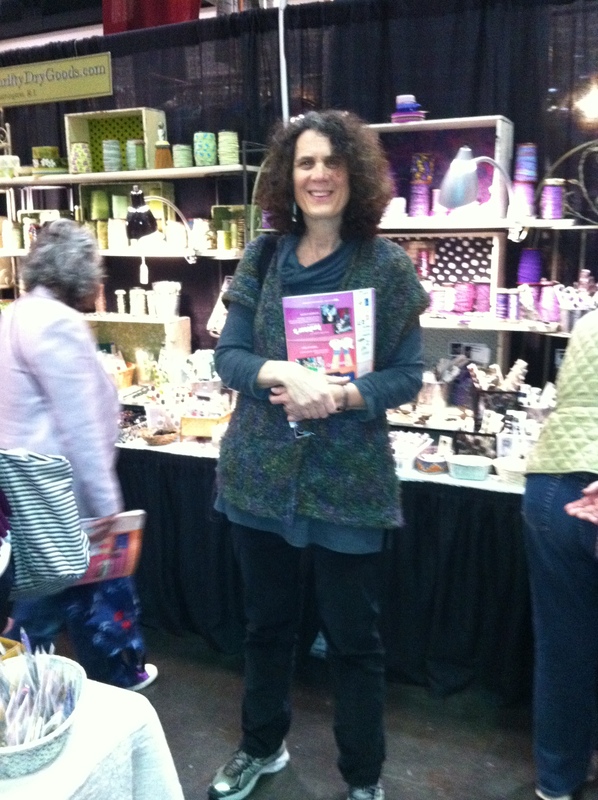 What a fun day….saw so many old friends…saw so much wonderful yarn! I had dreams of a marathon blog post on Saturday night when I got home…and wouldn’t you know it life “got in the way” and I am still dreaming about this blog/post….which will now appear in several installments. Reminds me of my childhood stories that I use to listen to on the wireless. I lived in Australia as a young child at a time when Australia was 25 years industrially behind the United States. I am the only person my age I know that grew up for a few years with a wood burning stove for cooking, a dry-ice refrigerator, an out-house, a wireless radio (my three favorite childhood serials were heard on that wireless)…..my parents had a Model T Ford and then a Model A Ford……I’ve never understood how T came before A….uh oh, more research ahead. Back to knitting and the wonderful “knitting homecoming”! Karen and I were just getting into line to enter the market when we ran into Megan and her mother Sulvana (drats I know I don’t have the spelling of her name correct). Megan use to work for me when Skein Lane had a store-front and her mother was a wonderful customer. Great to see them both! Karen and I entered the market with the other folks in a huge line which moved very quickly. We were barely in the door when we came upon Ellen 1/2 Pint’s booth. When I was a retailer at Stitches West Ellen 1/2 Pint was often the vendor across the aisle from Skein Lane. This vendor stop was nostalgic, exciting and sobering! I loved connecting with Carol and…..,I fell in love with a capelet shawl (Whimsey) and bought the kit… spent a few minutes talking with Carol about her health journey. She went to the doctor for concerns about a mole…. she had many more things wrong. She is now a cancer survivor and strong! I was so glad to reconnect with her. Drats..must go to bed….this is the end of part of the serial for this week…much to share…stay tuned for next “installment”.